Available on deals - check additional details and price. I want to buy it too. Don't know how it compares to the Cinevate duzi, the Rhinoslider and konova. The thing I like about it is the counterweight and belt system. Going to HK tomorrow. Will buy one to try out. Fingers crossed. Hope I don't regret it cos I have never tried a belt slider before. @shayanxtra have you tried it out yet? @cjdincer Yes, I did and I love it. Before now I have only used the Konova Slider and honestly I like this better. Bought it in Hongkong. I will make a video about it soon. thanks for your answer. waiting for the video. Here is a quick video review of the iFootage S1 Shark Slider. I have been very impressed with this little slider. Got it yesterday, brilliant piece of kit. I've had this thing a week now, and IMO there's no better slider out there, period. It all comes down to one unique feature: the belt-connected flywheel. The flywheel ensures consistent, smooth slides every time. Add to that the fact that everything on this slider is quality built, and you have a winner. At $600 USD shipped, it's a no-brainer. I've added a 6" tripod bowl riser, which gets the camera higher above the rails and allows me to do dolly in/out at 17mm focal length, with the slider in its longer setup. Switching from long to short setup takes only a couple minutes, and the extension joint is really solid and does not interfere with smooth slides whatsoever. While it can be set up on two light stands, I've found it is better to set it up on a tripod, and only use one light stand to support the extended end of the slider. 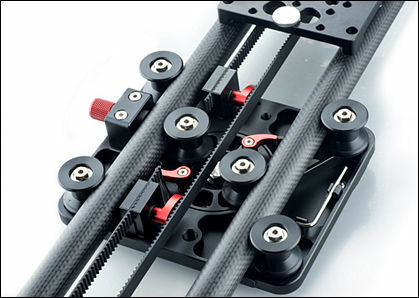 The only issue I foresee with this slider is wether the surface of the carbon fiber rods will hold up over time. But this is an issue with all sliders. If the rail gets marred, you're in trouble. With the iFootage design of an open carriage and track, it's very easy to keep the system clean and wiped clear of dirt and other obstructions. Finalky, I'm exceedingly happy with the complete modularity of the slider. Both end caps can detach from the rails, the carriage and wheels are removable, and things like belt and wheel tension are all quickly adjusted at the flip of a few thumbscrews. Everything is metal and carbon fiber, excepting the rubber rollers, so it will all last a very long time, but if I ever do need to service this slider, I'm very confident I can fix pretty much anything on it. I'm even tempted to go to the hardware store and buy the longest pipes I can along with an extra long belt, and see how well it works, it's that modular. Does anyone know what type of belt this slider is using? S3M? XL? and where to get one in the USA? -Thanks! Best idea is to get old belt, go to big shop who sell belts for cars and ask. 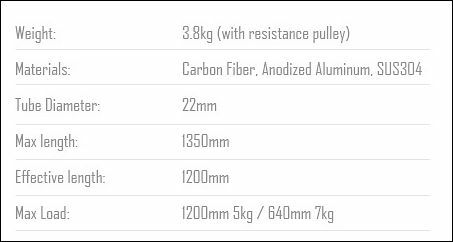 Another option is guys who sell belt for machinery like 3d printers and CNC.